The Digital Audio Converter, LPCM converts one LPCM-encoded coaxial (S/ PDIF) or optical (TOSLink) digital audio signal to a standard left/ right analog audio output, thereby allowing a digital audio source such as a DVD or CD player without RCA analog audio output to be connected to an audio-video receiver or TV. 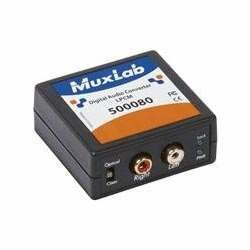 If you have any questions about this product by Muxlab, contact us by completing and submitting the form below. If you are looking for a specif part number, please include it with your message.